The new issue of Science only briefly touches on why this is the 2007 breakthrough. There's a short piece by Elizabeth Pennisi and another by Jocelyn Kaiser. There is also a video about halfway down on this page. At least they had a short part on the burgeoning industry of personal genomics. One area that they side-stepped however was all the genetic information we've been getting on population differences, and on genetic ancestry. Again, the whole thing was just too short. The cover photo is of a guy wearing a t-shirt that has the annotated gene-sequence map of human chromosome 1. This is the hypothesis that Richard Wrangham describes in his interview in this Scientific American article. This idea has been around for a while (see here, for example). The trouble has been establishing when hominins were able to "get fire". Some estimates point to as far back as 1.7 million years ago. In this interview, Richard Wrangham talks about the differences between chimp diets and human diets, and how modern day humans and hunter gatherers can't eat some of the fibrous, bitter, tough foods that chimps routinely rely on. He says that cooking food would have been the single greatest improvement in the quality of our diet - so he thinks that cooking would lead to a higher quality diet more so that just getting meat, or tubers, or nuts etc !!! This is the kind of hypothesis that is ripe (excuse the pun) for testing using genetics, as he mentions at the end of the interview when he talks about looking at genes involved in the Maillard reaction. I don't understand why he talks about using Homo erectus DNA though. First of all, that's not possible (yet? ), and I think there are ways to answer a question like that just using modern human DNA, or by comparing humans to other primates. I don't usually talk about popular science books, but this one looks pretty interesting, given that I'm interested in brain size and how it may be related to social intelligence. Abstract: The macaque radiation is as old as the hominin radiation, approximately 7 million years. After Homo, Macaca has the widest geographical range among primates, and both of these genera are present in tropical and temperate regions as well. Whereas the single extant representative of the genus Homo diverged through processes of cultural diversification, extant species of macaques emerged through processes of evolutionary diversification. Macaque societies are characterized by profound unity and great diversity, and can best be described as variations on the same theme. 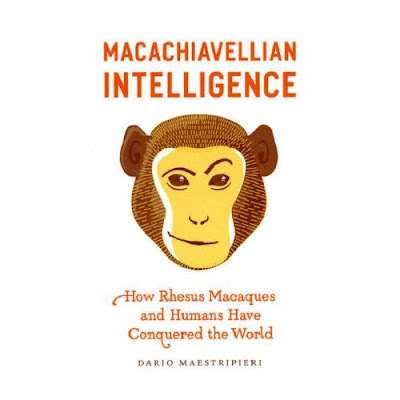 To understand macaque variation and adaptation, we must take into account the processes that insure the persistence of their societies across generations and environments. First what is NAT2? It's a gene involved in the acetylation of xenobiotics (foreign substances) and carcinogens - basically getting rid of toxins. They hypothesize that they will find different versions of this gene depending on whether a group is traditionally pastoralist or agriculturalist. They focus in on Central Asia where there is still some diversity among groups in subsistence. They don't really explain why there would have been selection for getting rid of foreign substances with an agricultural diet. They mention cooking meat at high temperatures, but that doesn't really seem to make the case... so, what is it about an agricultural, sedentary lifestyle that would select for the ability to neutralize or get rid of foreign stuff? This may be kinda obvious, like in the case of parasites, but they don't really seem to focus on that, so I wish they would have mentioned some other examples of what they meant. Anyway, their choice of populations to study seemed appropriate and interesting. A similar dichotomous pattern at the NAT2 gene has been observed among sub-Saharan Africans, where the Bantu-speaking agriculturalists presented a higher frequency of slow acetylators, as compared to the Pygmy hunter-gatherers (0.46 and 0.10, respectively).33 These significant differences in the frequency distribution of slow/fast acetylation phenotypes depending on lifestyle, attested by significant FST estimates, strongly suggest that being slow acetylator has been an advantage in long-term agriculturalist populations in Central Asia. This observation can be explained by three different, non-mutually exclusive hypotheses: (1) demographic processes, (2) balancing selection or (3) directional selection on standing variation. They go through each one and discuss it in light of their findings. All in all, I liked the general idea of the study, and I think that we will see many more such studies about recent selection due to novel environments. However, in this specific case, I am left to wonder about what exactly the selective advantage is in the environment of agricultural groups (what xenobiotics?, carcinogens? ), and if it is linked to the variants of this particular gene... probably beyond the scope and purpose of this particular study. Abstract: The arylamine N-acetyltransferase 2 (NAT2) enzyme detoxifies a wide spectrum of naturally occurring xenobiotics including carcinogens and drugs. Variation at the NAT2 gene has been linked to the human acetylation capacity, either 'slow' or 'fast', which modifies susceptibility to cancer and adverse drug reactions. We investigated the possible influence of natural selection in shaping the acetylation phenotype and the NAT2 gene variability in six Central Asian populations, who are either long-term sedentary agriculturalists (two Tajik populations), recent sedentary agriculturalists (Kazakhs, Uzbeks) or nomad pastoralists (two Kirghiz populations). To this end, we sequenced the entire NAT2 coding exon, as well as genotyping nine intergenic SNPs covering a 200-kb region. Our results revealed that the two Tajik populations exhibited significantly higher proportions of slow acetylators than the nomadic populations. In addition, sequence-based neutrality tests yielded significantly positive values in Central Asian populations following an agriculturalist lifestyle, due to an excess of haplotypes at intermediate frequencies. Taken together, our data suggest that balancing selection, and/or directional selection on standing low-frequency alleles, have shaped NAT2 genetic diversity and the human acetylation phenotype in Central Asian agriculturalists. These results further support the hypothesis that a major transition in human lifestyle, such as the emergence of farming has dramatically changed human chemical environments and the selective pressures they imposed. Abstract: Previous reports have shown a lower proportion of the ACTN3 X/X genotype (R577X nonsense polymorphism) in sprint-related athletes compared to the general population, possibly attributed to impairment of muscle function related to -actinin-3 deficiency. In the present study, we examined the frequency of the X/X genotype in both Black and White elite-level bodybuilders and strength athletes in comparison to the general population. A reference population of 668 Whites (363 men and 305 women) and 208 Blacks (98 men and 110 women) was genotyped for the ACTN3 R577X polymorphism. 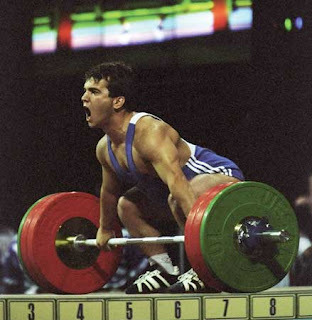 Strength athletes (52 white and 23 black; 4 women) consisting predominantly of world class and locally competitive bodybuilders, and elite powerlifters were recruited and similarly genotyped. Significantly lower X/X genotype frequencies were observed in the athletes (6.7%) vs controls (16.3%; P=0.005). The X/X genotype was significantly lower in White athletes (9.7%) vs controls (19.9%; P=0.018). No black athletes (0%) were observed with the X/X genotype, though this finding only approached statistical significance vs controls (4.8%; P=0.10). The results indicate that the ACTN3 R577X nonsense allele (X) is under-represented in elite strength athletes, consistent with previous reports indicating that -actinin-3 deficiency appears to impair muscle performance. These are very interesting and important findings. Can't wait to read the whole paper. Relationships between skin color, income, and blood pressure among African Americans in the CARDIA Study. Sweet E, McDade TW, Kiefe CI, Liu K.
Am J Public Health. 2007 Dec;97(12):2253-9. OBJECTIVES: We explored how income and skin color interact to influence the blood pressure of African American adults enrolled in the longitudinal Coronary Artery Risk Development in Young Adults (CARDIA) Study. METHODS: Data were derived from 1893 African American CARDIA year-15 participants who had undergone skin reflectance assessments at year 7. We adjusted for age, gender, body mass index, smoking status, and use of antihypertensive medication to examine whether year-15 self-reported family incomes, in interaction with skin reflectance, predicted blood pressure levels. RESULTS: Mean systolic and diastolic blood pressure levels were 117.1 (+/-16.07) and 76.9 (+/-12.5) mm Hg, respectively. After adjustment, the interaction between skin reflectance and income was significantly associated with systolic blood pressure (P< .01). Among lighter-skinned African Americans, systolic pressure decreased as income increased (b= -1.15, P<.001); among those with darker skin, systolic blood pressure increased with increasing income (b=0.10, P=.75). CONCLUSIONS: The protective gradient of income on systolic blood pressure seen among African Americans with lighter skin is not observed to the same degree among those with darker skin. Psychosocial stressors, including racial discrimination, may play a role in this relationship. This paper uses a life history perspective and data from two pygmy populations from the Philipito answer that question. I've only read the abstract, but it sounds like that they are arguing that being forced into early reproduction selected for less energy into body growth, due to high mortality levels. Why high mortality?... I don't know...maybe just being in the tropics?.. the answer is probably in the paper. Abstract: Explanations for the evolution of human pygmies continue to be a matter of controversy, recently fuelled by the disagreements surrounding the interpretation of the fossil hominin Homo floresiensis. Traditional hypotheses assume that the small body size of human pygmies is an adaptation to special challenges, such as thermoregulation, locomotion in dense forests, or endurance against starvation. Here, we present an analysis of stature, growth, and individual fitness for a large population of Aeta and a smaller one of Batak from the Philippines and compare it with data on other pygmy groups accumulated by anthropologists for a century. The results challenge traditional explanations of human pygmy body size. We argue that human pygmy populations and adaptations evolved independently as the result of a life history tradeoff between the fertility benefits of larger body size against the costs of late growth cessation, under circumstances of significant young and adult mortality. Human pygmies do not appear to have evolved through positive selection for small stature—this was a by-product of selection for early onset of reproduction. This paper examines whether a subset of AIMs (Ancestry Informative Markers) are useful for looking at admixture among indigenous South American populations, given that these AIMs were developed using North and Central American Native American parental populations. They find little difference between the frequencies of South and North American Native American populations. I wish I had full-text access to this paper to see the results more closely. 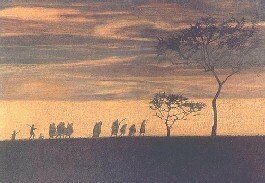 They looked at 4 tribes in the Amazon. They state in the abstract that those seven AIMs can be used to differentiate between the four tribes. That's surprising to me. Again, I wish I could see the results. Time for inter-library loan, I guess. Abstract: Ancestry informative markers (AIMs) are genetic loci with large frequency differences between the major ethnic groups and are very useful in admixture estimation. However, their frequencies are poorly known within South American indigenous populations, making it difficult to use them in admixture studies with Latin American populations, such as the trihybrid Brazilian population. To minimize this problem, the frequencies of the AIMs FY-null, RB2300, LPL, AT3-I/D, Sb19.3, APO, and PV92 were determined via PCR and PCR-RFLP in four tribes from Brazilian Amazon (Tikúna, Kashinawa, Baníwa, and Kanamarí), to evaluate their potential for discriminating indigenous populations from Europeans and Africans, as well as discriminating each tribe from the others. Although capable of differentiating tribes, as evidenced by the exact test of population differentiation, a neighbor-joining tree suggests that the AIMs are useless in obtaining reliable reconstructions of the biological relationships and evolutionary history that characterize the villages and tribes studied. The mean allele frequencies from these AIMs were very similar to those observed for North American natives. They discriminated Amerindians from Africans, but not from Europeans. On the other hand, the neighbor-joining dendrogram separated Africans and Europeans from Amerindians with a high statistical support (bootstrap = 0.989). The relatively low diversity (GST = 0.042) among North American natives and Amerindians from Brazilian Amazon agrees with the lack of intra-ethnic variation previously reported for these markers. Despite genetic drift effects, the mean allelic frequencies herein presented could be used as Amerindian parental frequencies in admixture estimates in urban Brazilian populations. 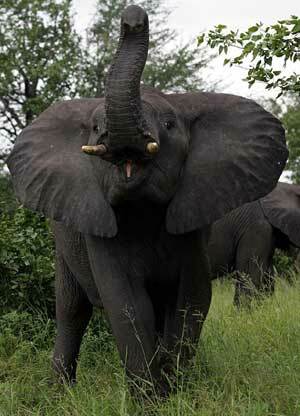 Elephants can classify human ethnic groups by odor? Granted, their findings are kind of cool, but their title made me expect more. I guess the interesting thing here is that elephants aren't scared of all humans, but discriminate between ethnic groups, based on their potential threat. Abstract: Animals can benefit from classifying predators or other dangers into categories, tailoring their escape strategies to the type and nature of the risk. Studies of alarm vocalizations have revealed various levels of sophistication in classification [1, 2, 3, 4, 5]. In many taxa, reactions to danger are inflexible, but some species can learn the level of threat presented by the local population of a predator [6, 7, 8] or by specific, recognizable individuals [9, 10]. Some species distinguish several species of predator, giving differentiated warning calls and escape reactions; here, we explore an animal's classification of subgroups within a species. We show that elephants distinguish at least two Kenyan ethnic groups and can identify them by olfactory and color cues independently. In the Amboseli ecosystem, Kenya, young Maasai men demonstrate virility by spearing elephants (Loxodonta africana), but Kamba agriculturalists pose little threat. Elephants showed greater fear when they detected the scent of garments previously worn by Maasai than by Kamba men, and they reacted aggressively to the color associated with Maasai. Elephants are therefore able to classify members of a single species into subgroups that pose different degrees of danger. This is the cover for the issue with a gene association study on pigmentation in Icelanders.